Next week is the GME. Untill now the only Mega event in the Netherlands. As you may have seen, the Event geocoin was designed and produced by the Geocachingshop.nl. By now the coin is sold out. We also made a GME Travel Tag, for those who were to late, you can buy the traveltag at our stand, to remember the biggest event of the Netherlands. For all GME visiters we have, just like last year, a small attention, this time in red-white-blue ;-). Fill out the voucher and give it at us in our stand at the GME. But we have lots of more news. First of all we can announce the ACE Geocacher. This trackable was at the ACE event in a special edition available, but from now we also have other versions in our shop. We also have a few ACE 2011 event specials on our site. New in our webshop is a collection of Victorinox knives and Geocoin coinalbums of the brand Importa. A sweet themed coin! Continuing the theme and style from last year, it's another abstract Rabbit for this year's Chinese Zodiac. On the backside is the Chinese Zodiac calendar, with all 12 signs represented. This coin is sure to find a place at the top of your collection. The dragon, according to Chinese legend, is a symbol of power, strength, and luck. This geocoin is based on a classic Chinese coin. The characters on the front mean: North , East, South, and West as the four winds and four cardinal directions. One sure sign of spring is seeing the tulips bloom. This geocoin was gemaakt with beautiful spingcolors and translucent enamel. np the back an intricate clock face. Available in antique gold with red tulps and antique silver with orange tulps. New in our assortment are the knives of Victorinox. This worldfamous and uiterst robuste merk, also known as Swiss knives. We have a few new "I Love Geocaching" wristbands in our shop: a Camo brown and Camo green, a Dutch version (red, white, blue) and a smaller kids version of the multicolor. For all the Geocoin collectors we have the Importa Geocoin albums in our collection. The album has a size of 24 x 27,5 cm and includes a cassette. We also have the coinsheets in 2 sizes: 12 sections (coinstill appr. 50 mm) and 30 sections (coins till appr. 30 mm). These albums are available in 5 colors. This is a Geocaching ACE who fast and efficiently finds caches. Hanging at your bag of keychain, this ACE can be discovered easily. Travelling from cache to cache, this ACE even can be by accompnied by a compagnon. This exclusive travel-tag is for sale on our stand at the GME. Part of the profit is for Scouting Erica. 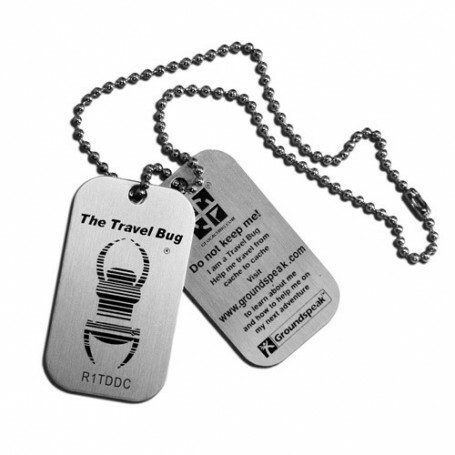 If there are traveltags left at the end of the day, they will be for sale at our website on sunday April 17th.